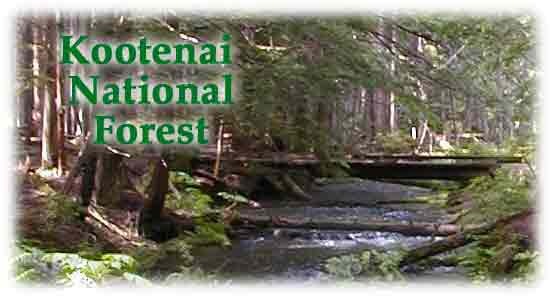 The 2.2 million acre Kootenai National Forest is located in the extreme northwest corner of Montana, bordered on the north by Canada and on the west by Idaho. Of the total acres, 50,384 are in the State of Idaho. The Kootenai has been, and will continue to be, Montana's premier timber-producing forest. Ranges of high, craggy peaks mark the Forest with Snowshoe Peak in the Cabinet Mountains Wilderness at 8,738 feet, the highest point. The Whitefish Range, Purcell Mountains, Bitterroot Range, Salish Mountains, and Cabinet Mountains are all part of the rugged terrain radiating from the river valleys. In the north-central part of the Forest, the land is more open with gently rolling timbered hills lying in the shadows of the Whitefish Range. Access into the Forest is available from U.S. Highways 2 and 93, and Montana State Highways 37, 56, 200, and 508. 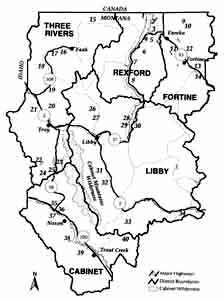 The Forest is dominated by two major rivers: the Kootenai and Clark Fork, along with several smaller rivers and their tributaries. Two dams on the Clark Fork have created the Cabinet Gorge and Noxon Reservoirs within the Forest boundary. Highway 200 parallels these reservoirs as it crosses the Forest. The Kootenai River is bridled by Libby Dam, creating Lake Koocanusa, a 90-mile-long reservoir reaching into Canada. Lake Koocanusa, 16 miles north of Libby, is almost totally encompassed by Forest land with Highway 37 following the east shore to Rexford, and a Forest road along the west shore to within a few miles of Canada. The elevation of the Kootenai River as it leaves the Forest and the State is 1,862 feet, the lowest point in Montana. 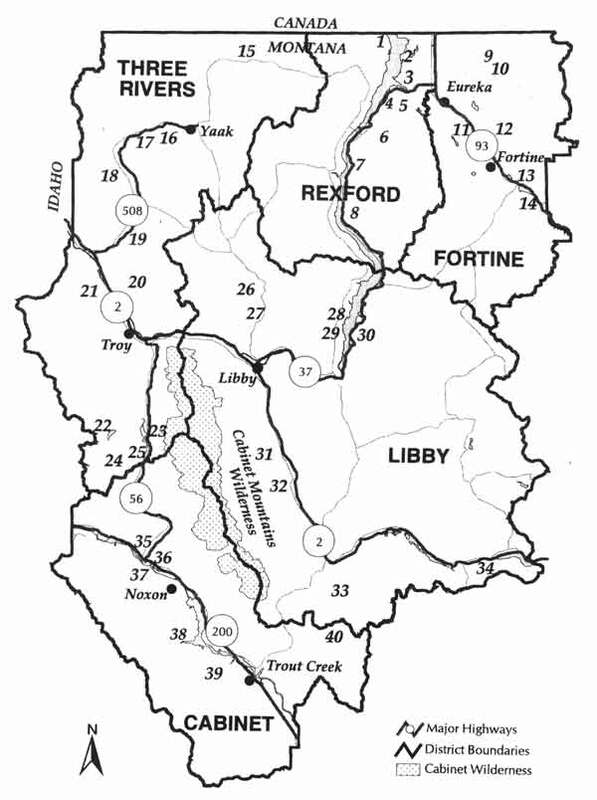 The Yaak, Fisher, Tobacco, Bull, and Vermillion Rivers are smaller rivers within the confines of the Forest. There are 141 lakes located within the Forest boundaries that range from small alpine lakes to 1,240-acre Bull Lake. Hikers will find stands of alpine larch on Northwest Peak in the 19,000-acre Northwest Peaks Scenic Area, while grand old firs line the Fisher Mountain-Tepee Lake Trail. The gnarled whitebark pine greets walkers in the beautiful 15,700-acre Ten Lakes Scenic Area. And finally, for a taste of one of the grandest trees anywhere on the continent, head for the Ross Creek Cedar Grove. Wildlife that are common include deer, elk, moose and bear. The Wilderness is home to mountain lion and grizzly bear, but the chances of seeing one are very slim. 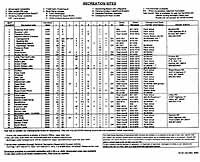 Over 190 species of birds live on the Kootenai National Forest, and avid birdwatchers can pick up check-off lists at the local Forest Service District offices. Along the rivers, Bald eagles, great blue herons, kingfishers and dippers can be found. Trees native to the area include western red cedar, western hemlock, western white pine, lodgepole pine, ponderosa pine, alpine larch, western larch, mountain hemlock, grand fir, subalpine fir, whitebark pine, Douglas-fir, Englemann spruce and juniper. Cottonwood, quaking aspen, alder and paper birch grow in the moist sites and valley bottoms. Above 6,000 feet the vegetation becomes scattered, with stunted and gnarled mountain hemlock, whitebark pine and alpine larch growing out of rocky rims and ledges, many with broken tops and twisted forms attesting to the tremendous volumes of snow. Snowstorms occur as late as June and as early as September limiting most backpacking and hiking to the summer months. Plant growth is dense along streamsides at lower elevations. Common plants include huckleberry, snowberry, mountain maple, serviceberry, chokecherry, wild rose, kinnikinnick and dogwood. Wildflowers bloom throughout the summer and include lupine, arrowleaf balsamroot, beargrass, violets, trillium, columbine and Indian paintbrush. All page content copyright 20041. All rights reserved. Photos by LibbyMT.com unless otherwise credited. 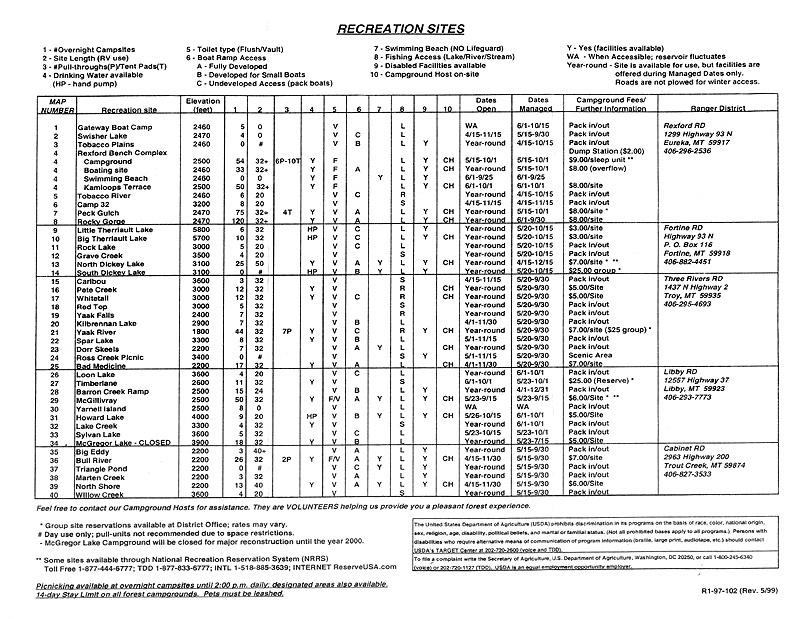 Recreation chart and maps from Kootenai National Forest Recreational brochures.